See how the Newport haven was transformed by bringing the outdoors in. Burns sought a modern, glam vibe for the home. “I wanted it to feel luxurious but still beachy and cozy at the same time,” she says. A built-in bookshelf that previously divided the kitchen was removed to open up the space–which is integrated with the living and dining rooms–and enhance the flow of light. To further brighten the area, an exterior wall was replaced with French doors that now lead to a new multi-level deck. To establish a cohesive color palette, cues were taken from the landscape. “There’s a ton of greenery outside around the house,” says Burns. 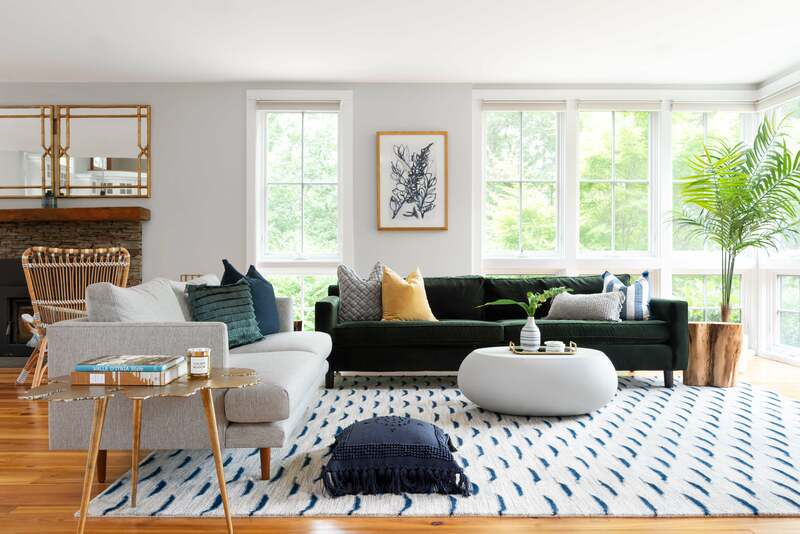 “I brought that color inside, starting with the green velvet Lillian August sofa.” Now, where baby blue once dominated, a green, navy, and gold scheme prevails. In the dining room, Anthropologie wallpaper that depicts tree branches against a pale green background emulates the surrounding landscape of the home. In the guest bedroom, the bed comes with an upholstered headboard bearing oversized leaves, from AllModern. To make the striking headboard even more of a focal point, an accent wall behind the bed–and the closet doors– is painted in a striking black and white combination. Photography by Tamara Flanagan | Sherwin Williams Tricorn Black, Benjamin Moore White Dove. The trend of large scale leaves continues in the first floor powder where the walls are sheathed with a wallpaper by Brewster Wall Covering, featuring palm leaves in blue, rather than green, which adds a touch of whimsy and feels at home in a beach haven. Natural, earthy elements also play into the theme of bringing the outdoors in while adding on multiple layers of texture. In the living room, high-backed rattan chairs scored on One Kings Lane offer flexible seating. The farmhouse-style wood dining table from Mcgee & Co. has a rustic appeal. Another woven element is the headboard in the master bedroom, where Serena & Lily wallpaper infuses the space with a subtle shade of blue. Burns replaced all of the lighting in the home—which previously consisted of artsy glass fixtures that strongly differed from the calm, sophisticated vibe she was going for. In many spaces, fixtures add flair without dominating the setting. In the master bathroom, a Justina Blakeney chandelier made of fringe feels fancy yet playful. Over the kitchen island, navy blue pendants offer an appealing contrast to the mostly white space and the gold stools add just the right amount of glam. The home now has an interior as idyllic as the setting.